Call or Telefax Metritape for a complete DeckMaster Brochure. PLEASE VISTT US AT BOOTH # 6E17 r#Jt Metritape 59 PORTER ROAD, PO. BOX 2346, LITTLETON, MA 01460 U.S.A. 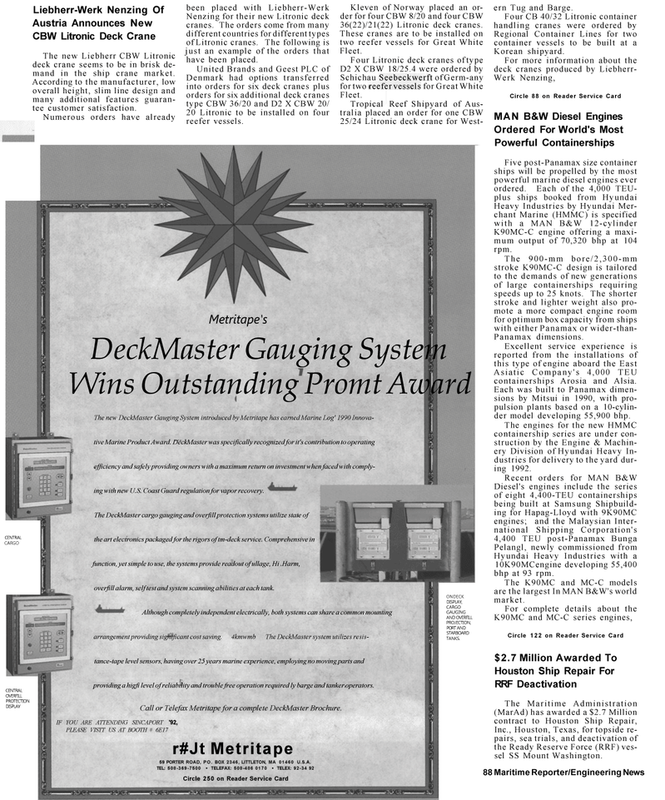 The new DeckMaster Gauging System introduced by Metritape has earned Marine Log' 1990 Innova- tive Marine Product Award. DeckMaster was specifically recognized for it's contribution to operating efficiency and safely providing owners with a maximum return on investment when faced with comply- ing with new U.S. Coast Guard regulation for vapor recovery. The DeckMaster cargo gauging and overfill protection systems utilize state of the art electronics packaged for the rigors of tm-deck service. Comprehensive in function, yet simple to use, the systems provide readout of ullage, Hi .Harm, overfill alarm, self test and system scanning abilities at each tank. Although completely independent electrically, both systems can share a common mounting arrangement providing significant cost saving. 4kmwmb The DeckMaster system utilizes resis- tance-tape level sensors, having over 25 years marine experience, employing no moving parts and providing a higfi level of reliability and trouble free operation required ly barge and tanker operators. ern Tug and Barge. K90MC-C engine offering a maxi- mum output of 70,320 bhp at 104 rpm. Asiatic Company's 4,000 TEU containerships Arosia and Alsia. Each was built to Panamax dimen- sions by Mitsui in 1990, with pro- pulsion plants based on a 10-cylin- der model developing 55,900 bhp. The engines for the new HMMC containership series are under con- struction by the Engine & Machin- ery Division of Hyundai Heavy In- dustries for delivery to the yard dur- ing 1992. Hyundai Heavy Industries with a 10K90MCengine developing 55,400 bhp at 93 rpm. The K90MC and MC-C models are the largest In MAN B&W's world market. The new Liebherr CBW Litronic deck crane seems to be in brisk de- mand in the ship crane market. According to the manufacturer, low overall height, slim line design and many additional features guaran- tee customer satisfaction. Nenzing for their new Litronic deck cranes. The orders come from many different countries for different types of Litronic cranes. The following is just an example of the orders that have been placed. Denmark had options transferred into orders for six deck cranes plus orders for six additional deck cranes type CBW 36/20 and D2 X CBW 20/ 20 Litronic to be installed on four reefer vessels. Kleven of Norway placed an or- der for four CBW 8/20 and four CBW 36(22)/21(22) Litronic deck cranes.